The word Turquoise is synonymous with Blue, such is the importance of this much prized stone that has been known to humanity for thousands of years. Learn more about this highly sought after mineral that has adorned Egyptian pharaohs and Indian chiefs alike. Turquoise is perhaps one of the world’s most well-known semi precious gemstones. 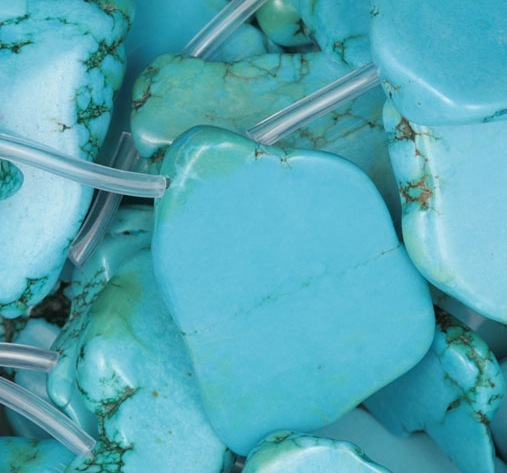 Known to and loved by cultures both past and present on five continents, turquoise is certainly one of the first ornamental stones to be mined and traded. It has been used as a symbol of wealth, power and spirituality by diverse cultures. Certain shades of blue have even been named after turquoise which itself derives its name from the French word for “Turkish”. It would have been a misconception on the part of European traders in the 16th century who purchased the lovely blue stone in Turkish souks and bazaars, not realizing that their purchases came from farther a field. Certainly, turquoise goes by other names in cultures that knew the stone long before it reached Europe. Different locations around the world yield turquoise in distinctly different shades, colour and texture and it is not uncommon to find turquoise enthusiasts who will know the origins of a sample of turquoise on sight, right down to the name of the mine. The turquoise forms when copper, aluminium and phosphorous are released from their source rocks, either through weathering, erosion and leaching by underground water, or by the extreme heat from magma intrusions pushing up from deep within the earth during volcanic activity. The released minerals are dissolved and mix together. The solution flows into fissures and cracks in the host rock where, under pressure for a long time, it crystallizes. When there is silica present in the magma intrusions , it will mix with the other elements, resulting in silicification and harder turquoise. Conversely, turquoise that lies at greater depths within the earth is more subject to erosion by ground water percolating through it, increasing its porosity and resulting in softer material. Over the ages, the bulk of the harder material closest to the surface of the earth has been mined, leaving predominantly the softer, chalkier deposits. There is great variety in the colour of turquoise, from blue to green to yellow. Some of the finest material from Iran is an intense, clean, blue. The Sleeping Beauty mine in the US produces a lighter blue. Tibet is known for shades of rich, dark green. It is the copper present in turquoise that is responsible for it being blue, whilst impurities of iron are responsible for the green hues. The higher the concentration of iron the greener the turquoise. The presence of zinc, magnesium, calcium and other elements also influence the colour. Zinc, for example, creates a vibrant apple green. Turquoise often exhibits inclusions such as grains of quartz, iron oxide, or even pyrite. An interesting phenomenon is veining or “spider webbing. ” These are patterns of random, brown or black lines criss-crossing the stone. These are formed when small cracks in the turquoise are filled with iron oxide. In some stones the webbing is highly valued, yet in others a clean, uniform stone is prized. As already mentioned, harder, silicified turquoise is a rarity. Most of the turquoise found worldwide is soft and chalky. It has been estimated that less than 3% of the world’s supply of turquoise can be used in its purely natural state for jewellery, as most is soft and crumbly. In times past, stone cutters compensated for turquoise’s chalkiness by rubbing waxes or oils into it. 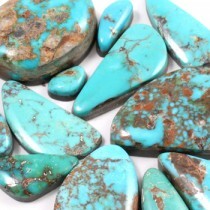 More recently, techniques have been developed which help to strengthen turquoise, a process called stabilization. This involves impregnating the material with a clear epoxy resin, which effectively is absorbed by the turquoise and fills the pores in the chalky material, much like silica does, thus hardening the stone. It has the same effect on the stone as wetting a stone does – it darkens and intensifies the colour slightly. The impregnated turquoise can now be cut, polished and set in jewellery without crumbling. An even newer technique involves impregnating the material with silica, thus rendering the stabilized turquoise practical identical to un-enhanced material. Stabilization is generally accepted in gemmological circles (except by purists), as there would be very little turquoise available for consumption if the process was not used. Less acceptable, however, yet still very prevalent, are other techniques such as dying and reconstituting. Dying involves using synthetic dyes to create or enhance the colour of turquoise. Reconstituting involves grounding pieces of turquoise to a powder and binding it all together with glue or resin. Though made from the same stuff as turquoise, it is stretching things a little to consider reconstituted turquoise as a natural mineral. In the South Western USA, it is almost universal for turquoise cabochons to be cut very thinly and “backed”, that is to say, glued to a base made from a stronger material, such as an epoxy. This practice, first initiated by Indigenous Americans, serves to make the cabochons more durable. There are countless synthetic and fake turquoises available on the market. “Turquoise” has been produced from resins and plastics and even cement and plaster. It is common to find howlite and magnesite dyed blue and passed off as turquoise too. These are white coloured minerals that exhibit veining similar to that found in turquoise. The phenomenon of synthetic turquoise dates back to Ancient Egypt, where craftspeople created “faience”, a copper glazed ceramic, which came into vogue when turquoise from their local mines became scarce. Far too often other naturally blue stones, particularly chrysacolla, are passed off as or mistaken for turquoise. adorned the pharaohs of Ancient Egypt in the form of jewellery and amulets. The Persians mined it and carved amulets of Persian and Islamic verse and traded it with Asia and Europe. In the Americas, turquoise was heavily traded and was even used as currency by some tribes. It was used to embellish sacred objects and jewellery and was (and still is) held in high esteem, earning names like “Chal-cui-hui-tal” which translates as “the highest and most valuable thing in the world”. It was also referred to as the “fallen sky” stone. Indigenous Americans have developed their own contemporary style of silver jewellery that still relies greatly on turquoise. Tibetans have long revered turquoise, attributing to it healing powers and using it in religious ceremonies, including as rosaries in the worship of the goddess Tara. To this day it is combined with red coral and precious metals as jewellery. In Europe it was considered a love charm and was given as gifts to make ones affection known. This is captured in Shakespeare’s “The Merchant of Venice’, where a turquoise ring is given to Shylock by Leah, in the hope that he would marry her. In Russia, where it is said to promote matrimonial harmony, turquoise is still popular in wedding rings. In the late 19th century, turquoise became popular in European jewellery. Turquoise is considered a protective stone of high spirituality. Both Tibetan and Native American lore hold turquoise in high esteem as a protector, particularly on the spiritual path. It helps to keep one grounded whilst meditating, allowing meditations to be deep and detached, but protected. It is also hailed as a healing stone, particularly of the spirit. It dissipates negativity in ones environment and initiates balance, bringing relief to stress and a sense of peace and calm. It helps one to attune spiritually whilst maintaining ones physical, worldly awareness. Perhaps turquoise’s most valuable trait is its gift of Wholeness. It helps us to recognise our many different aspects and to accept them as intrinsic and valuable parts of our whole selves. It is through acceptance of all of our parts, both noble and unworthy, both positive and negative, that we experience self-forgiveness and self-acceptance and can truly be whole. It is through the personal experience of wholeness that we can experience Universal Oneness. Turquoise stimulates and brings balance to the throat, heart and navel chakras. It enhances communication skills, particularly in the articulation of emotional issues and creative expression. Other traits attributed to turquoise include its ability to change colour when danger is near, its ability to stimulate love and its usefulness in initiating rain. 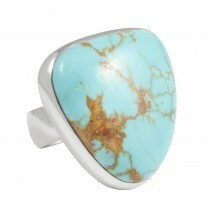 Turquoise is associated with the horoscopes of Pisces, Scorpio and Sagittarius and vibrates to the number 1.